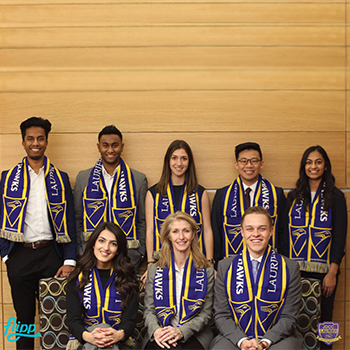 All of the JDCC Laurier team’s preparation paid off at the JDC Central Competition hosted at the University of Guelph last month. The team, led by captain Sania Lalani, represented the school with a stellar turnout of 11 podium finishes including two first place, four second place, four third place as well as the Faculty of the Year Award. The students dedicated every Sunday through the fall term to learn and practice for the competition. Weekend seminars led by professor Sofy Carayannopoulos covered everything from financial analysis under pressure to compelling storytelling and presentation skills. Teams also participated in a case each week, consisting of a three-hour, internet free resolution and a 20-minute presentation. This year’s teams responded to cases related to new market entry, new product development, and blockchain, among others. Not only did the team come in second in the Academic Cup and School of the Year categories, but associate professor Sofy Carayannopoulos was named Faculty Advisor of the Year for her tremendous dedication to supporting our students. Congratulations to the 2018/19 JDCC Laurier team!